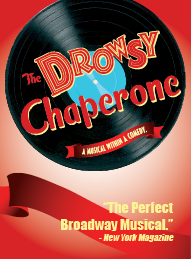 County Players Presents "Drowsy Chaperone"
A parody of American musical comedy of the 1920s, the story concerns a middle-aged, musical theatre fan. As he plays the record of his favorite musical, the (fictional) 1928 hit The Drowsy Chaperone, the show comes to life onstage. The plot incorporates mistaken identities, dream sequences, spit takes, an unflappable English butler, an absent-minded dowager, a Broadway impresario, comic gangsters, a ditzy chorine, a harried best man, and a Drowsy (i.e. tipsy) Chaperone, played in the show-within-a-show by a blowzy Grande Dame of the Stage. The Drowsy Chaperone is a masterful meta-musical, poking fun at the musical theatre genre.